Ground Floor: Living room (Sat TV, DVD, CD, WiFi, wood burner) with doors to terrace. Kitchen/diner (oven, microwave, dishwasher). Double bedroom (A/C) with doors to terrace. Twin bedroom (A/C). Bathroom. Outside: Dining terrace. Barbecue. Shaded seating terrace. Sun terrace. Table Tennis. Laundry room (washing machine). Shower room. Private parking. Private, kidney-shaped swimming pool (6m x 4m) with Roman steps. 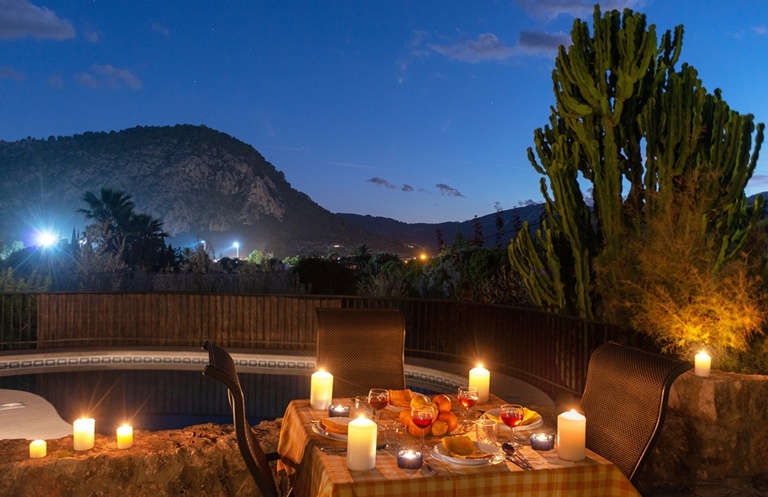 Overlooking the main Pollença road that circles the historic Roman town, this attractively quaint and quirky property enjoys a very scenic outlook to the Puig de Maria and Tramuntana foothills along with the convenience of being close to all local amenities including several excellent restaurants. Simple in style, with a welcoming interior of time-honoured design, feature walls of Mallorcan stone and terracotta tiled floors sit under vaulted beamed ceilings, a clever fusion of traditional and contemporary colour and décor completing the portrait. The double and twin bedroom each feature air conditioning and are unfussy in nature, with the principal bedroom benefitting from patio doors onto one of the pretty stone terraces that flank the house. Outside, mature trees and shrubs border a dining terrace, where a hand built stone table is perfectly positioned to enjoy views of the Puig whilst enjoying meals al fresco. A couple of steps lead down to the swimming pool with grounds of a small lawn, olive and lemon trees just beyond. This property is all about position being wonderfully convenient for exploring the immediate locale (the famous central square (Plaça Major) of Pollença Town, with its abundant choice of restaurants and shops is just 1.4km away) as well as further afield. The white sandy coves of Cala San Vicente (6.1km) and broad sweeping curve of Port de Pollença (6.5km) where you will find watersports, boat hire and beach bars are both within easy distance while tennis, golf, cycling and walking are also readily available in and around the immediate area. For many, no visit to Pollença Town is complete without ascending the Puig de Maria and/or the 365 steps of the Carrer del Calvari to the small chapel at the top. Each of these iconic locations offers the most incredible views of the town and surrounding landscape. Please note: A low wall along one of the terrace edges means that young children would need supervision. The market in Pollença is a colourful bustling event where you can buy locally grown fresh fruit and vegetables as well as souvenirs and presents. It's worth having a look inside the impressive church while you are there. Follow the mountain road from Pollença to Lluc Monastery. Visit the museum and the chapel where you may be fortunate to hear the Blauets Choir sing. Don't miss the small botanic garden at the back of the monastery which takes about 15 minutes to walk round or the rock formation in the shape of a camel. The beach at Port de Pollença is spacious and has all amenities with parking along the seafront. Cala Sant Vicenç has 2 small beaches and the Formentor beach, although further away, is worth spending the day at. The Caves of Campanet, discovered by a shepherd about 100 years ago, are not too far away and worth a visit if you like to see the fascinating stalagmite and stalactite formations. These caves are not too commercialised and visits are on the hour. For Mallorca's most impressive caves, go to Portocristo on the east coast and visit the Caves of Drach. While the 9-hole golf course at Pollença is only a short drive away, the tennis courts at the Pollença Municipal Sports ground are within walking distance of Casita Miguel. The start for the walk to the top of Puig de Maria is on the road towards Palma, a short way from the rooster roundabout on the left - it's best to go early in the morning. Don't forget your camera, wear sensible shoes and take water to drink although there is a bar at the top. The views over the north coast are outstanding. The nearest waterpark to Pollença is Hidropark at Port d'Alcúdia where there is also a mini-golf course! The others are in the south of the island at El Arenal and Magalluf. At Costa den Blanes there is Marineland which has dolphin, sea lion and parrots shows and an excellent Aquarium at Ca'n Pastilla. Spend time walking around the town of Pollença, browsing in the quaint little shops and making the effort to climb the 365 steps up to Calvary church before sitting down for a drink and dinner in one of the pedestrianised squares. If you would like to do a bit of snorkelling in clear, deep waters, go towards Alcúdia, turn off to Mal Pas on the road towards the headland of La Victòria. Beside a fish restaurant serving lobster (choose your own), there is an excellent area off the rocks for snorkelling. Tuesday market in Old Alcúdia is interesting and has a plentiful supply of locally grown fresh fruit and vegetables, then just stroll round the pedestrianised old Roman town where caper plants are growing out of the main massive thick stone walls surrounding the town. Pollença is famous for its simulated Battle of the Moors and the Christians which takes place on 01-02 August. The whole town takes part in the celebrations. Ornithologists will know about the birdwatching area at the Albufera and Albufereta, where you can see several different species of wading birds, amongst others. The Pollença Classical Music Festival is held at the Cloisters in July and August, featuring various well-known bands, quartets and soloists - a great variety of programmes to choose from. Take a train and a tram! Take the old-fashioned train ride through the mountains and tunnels from Palma (or Bunyola) to Sóller and don't miss the tram to the Port de Sóller through the orange groves and back. Just sit in the church square in Sóller, enjoy a drink and local pastry, relax and watch the world go by. There are several vineyards in Mallorca where you can visit and try the wine – Vinyes Mortitx is on the road to Pollença-Lluc road at KM 10,9; Bodegues Macià Batle is at the entrance to Santa Maria on the main road towards Consell; and in Binissalem is the better-known Bodega José L. Ferrer. No visits during the grape harvest in September although the wine festival in Binissalem is worth joining in. If you'd like to visit the capital city, Palma, and are not keen on driving, then take the train from Sa Pobla. Palma is an excellent shopping centre and has many interesting historical buildings to visit - the Cathedral, Moorish Palace and impressive Bellver Castle for example. A scenic drive will take you to Formentor lighthouse - the road is quite narrow in places. At the top of the hill out of Port de Pollença, stop at the viewpoint to see the dramatic vertical drops to the sea and El Colomer rock. The beach at Formentor is not very large but has clear shallow water ideal for children and adults alike with some good areas for snorkelling. Go early, with a picnic. Make your way to the top of the hill to Castell d'Alaró - take water to drink as the last part of the journey has to be done on foot. The views from the top are breathtakingly beautiful! On the way down enjoy a meal at the Restaurant Es Verger where they serve tasty roast lamb done in a traditional Mallorcan oven. Driving over the Tramuntana mountain roads taking in the spectacular scenery, stopping at the various viewpoints including the two lake/reservoirs, and passing through several world renowned towns like Deià and Valldemossa, home to famous writers, painters and musicians. Look out for the wild mountain goats on the way.